I, (Jim Ewers), first considered the idea of growing grapes in the mid-1990’s, so I consulted some of the local Southern Illinois wineries and mulled over the idea with my father-in-law, Barrett Rochman. 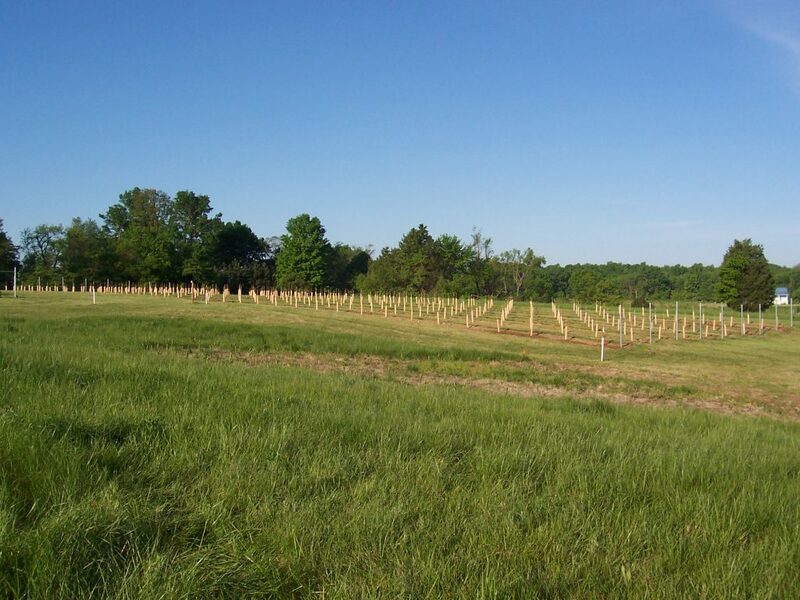 Although I realized I couldn’t commit to the project at that time, the seed fell on fertile soil in Barrett’s mind and Blue Sky Vineyard was transformed from mere idea to vision. When my former place of employment closed in 1999, Barrett reintroduced the vineyard vision and shortly thereafter we spent a rainy afternoon with state viticulturist, Imed Dami, determining where to plant the grapes. Many hours of planning, reading, and preparation ensued, and it was during a course at a local community college that I met Gary Orlandini, a seasoned veteran winemaker. 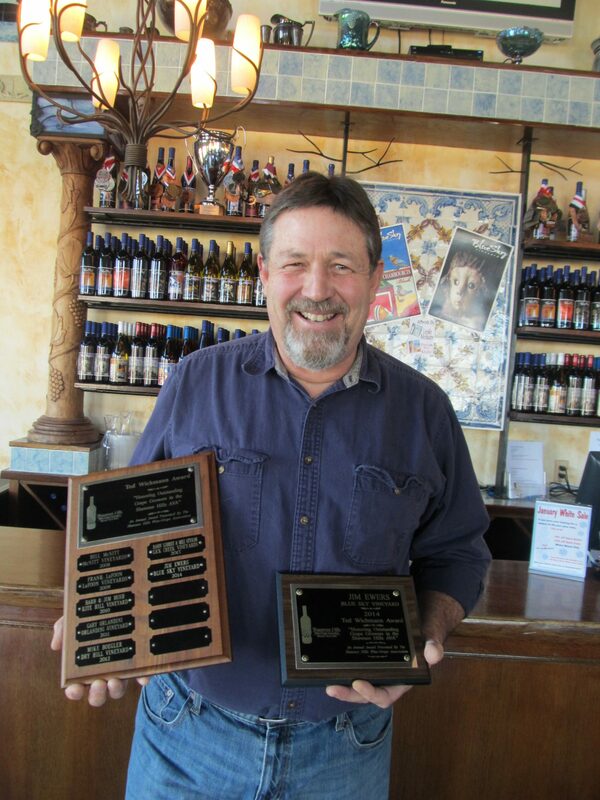 His inspiration and insight paired with Karen Hand’s mastery of winemaking is what you will taste in our Illinois wines. In the fall of 2000, I prepped the first 2 ½ acres of ground to be planted the following spring. An instructor I had once said, “Absolute precision is not necessary when laying out the rows of grapes.” Too late, my first blocks were already laid out using a transit, tape, and string line. Although I have since modified the method of laying out the rows to some extent, I still make sure that the blocks are square, parallel and spaced with unnecessary precision. I find a great inner calm when I look out over a field of grow tubes laid out with such symmetry. It this attention to detail, that ensures the highest quality grapes go into our Illinois wines. With the grapes planted and the winemaking underway, our family turned their sights toward the winery itself. 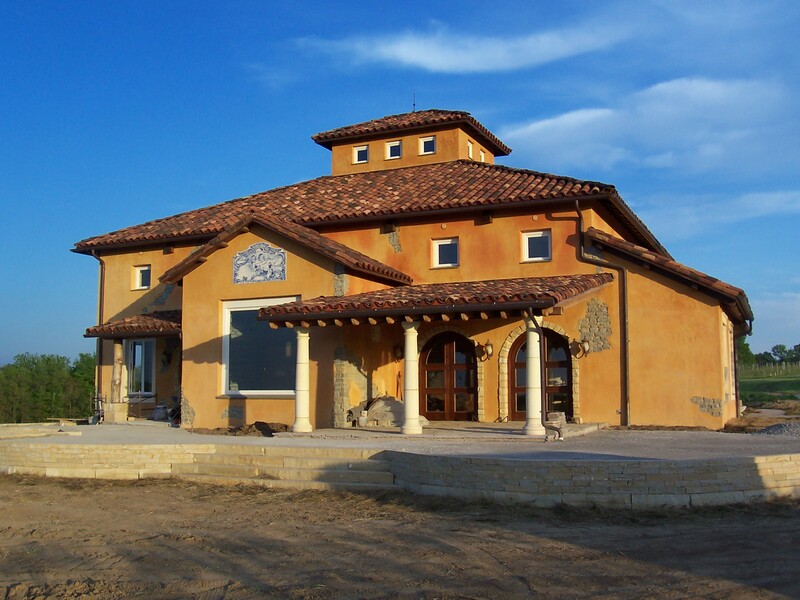 Nancy Karen Brian, Chairman of the Department of Design at California State University, Fresno, designed the Tuscan inspired Blue Sky Winery. After years of dedication and attention to every detail we opened our doors to the world on July 4th, 2005. Ever since then, we have continually strived to create a place of great tranquility. As the photos in our gallery will attest, this marvelous location is ideal for weddings, receptions, and romantic getaways.